Sometimes in the world of independent publishing a work comes along that is powerful enough that it is destined to make waves in the community of fans outside of which it would normally be most appreciated. One comic that this certainly applies to is “Black Hole” by Charles Burns. 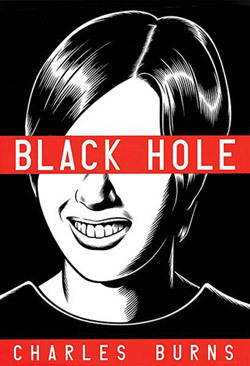 To call “Black Hole” a masterwork is no small praise considering that Burns has been creating brilliant comics since the 1980’s when he was a regular contributor to Art Speigleman’s legendary RAW magazine.It has been published over a period of ten years (first by Kitchen Sink Press, then later by Fantagraphics) spanning twelve issues total. Our story tales place in 1970’s Seattle and concerns a mysterious sexually transmitted disease that is spreading like a plague amongst the local teenagers. The disease causes horrible mutations of the body, the severity of which differs from person to person. While one person may only grow an easily hidden tail, others undergo dramatic deformations. In the opening pages of the individual issues there would be matching, full-page illustrations, much like a high school yearbook photo, of the before and after effects of the teen plague.It’s a startling image and a perfect one to set the tone for the rest of the book. Burns’ art, the precision with which he composes his line work, demonstrates an almost inhuman precision. The rich blacks and sharp lines that are on his pages perfectly express the psychological horror his characters are facing. Our teenage years are already filled with enough anxiety about physical appearance and changing bodies, that when this horrifying disease is entered into the mix, little is outside the realm of possibility to those affected, including cold-blooded murder. “Black Hole” has, since it’s conclusion, been collected in both a hardcover and softcover edition by Pantheon.It has earned the highest possible recommendation.